The new trends in kitchen design are rolling out for 2019, and we are going to talk about a few things that affect the countertop fabrication end of these trends. While the white kitchen trend is easing off, much to the joy of families with toddlers and messy cooks, we can’t help but notice the minimalists still love white countertops. Maybe it's because they offer clean lines, lots of reflected light, and a deep bow to Marie Kondo. It may not be right for everyone, but it’s still wildly popular in countertops. Matte finishes are everywhere, and honed countertops fall nicely into the blend of matte cabinets, appliances, and other kitchen surfaces. It might be because some folks can’t shake the feeling that there is more to life than wiping fingerprints off of everything. 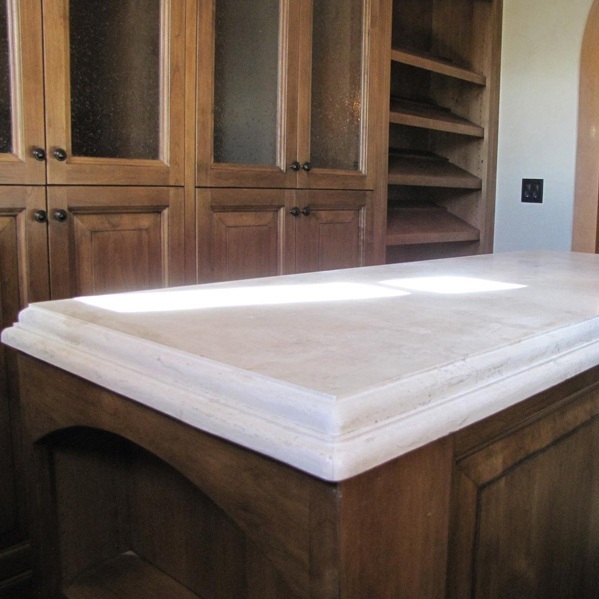 Single level islands and countertops keep things simple and provide more unfettered space. We have installed countertops both ways and defer to the wishes and needs of the homeowner on this, because, as much as ‘space’ can be an argued thing, a kitchen should be precisely the way the homeowner wants it. Another popular new style is countertops extended over the edge of the kitchen island, which creates more seating in a pinch or a place for friends and family to sit and lend a hand or enjoy the company of the cook during meal prep. Just when you thought the countertop couldn’t get any better, sinks have suddenly taken a turn in a playful and fun direction. In addition to all manner of angled prep drains, slides to suddenly create more working space over the sink (and hide your dirty dishes! ), cutting boards, colanders and more. Faucets in copper, bronze, gold, and lots of brass are high tech and innovative (think folding) and a variety of sizes and styles move trends away from universal-sized sinks. Quartz is screaming hot, and the bold, eye-popping colors are playing just as hard as the dark, somber matte. While it won’t take the heat of a pan straight off the burner, in most other ways, it’s almost indestructible. While sinks, faucets, and appliances are getting more sophisticated, the overall kitchen trend is moving away from fussy, cluttered-looking kitchen decor. Instead, we’re seeing clean lines, less fuss, and cleared counters. The minimalist attitude is going mainstream, as families embrace quality, easy-to-care-for countertops and tile which will offer soothing elegance for decades to come.